Plants and dirt and the stories they tell. I love plants. I love tending them. I love getting the back of my neck sunburned from being on my knees all day. I love getting dirt under my fingernails, and smelling its musty aroma as the brown stuff washes from my hands down the drain. A day spent in the sun working the soil is a day seized in my book. Claire Waverly loves plants too. A few steps from the back door of the large Victorian her family has always owned in Bascom, North Carolina is the garden she tends; the garden she loves; the source of her successful catering business. For her, plants equal magic. They’re her second language. Want to keep a secret? Add nasturtiums to your salads. Keep children thoughtful? Sugared pansies on the cake. Get rid of an unwanted neighbor? A snapdragon soufflé. She has a gift. All of the Waverly’s do. Claire likes to keep hers quietly to herself, living alone in her family’s old house, ignoring the children who occasionally try to get a peek over her tall picketed fence at that mysterious enchanted apple tree in the center of her garden. But suddenly her plants begin to change, and so does her life. A new interested neighbor moves in next door. Her fly-by-night sister returns with a daughter unexpectedly, and her elderly cousin keeps leaving unwanted gifts. What’s a girl who wants her heart locked up tight to do? Give in, of course. A good heroine always gives in, a little anyway. If you’ve read or seen the movie Practical Magic, this all probably sounds vaguely familiar. Both are stories that revolve around the lives of two sisters, one mature beyond her years and one escaping from an abusive relationship, polar opposites in almost every way but for their magical gifts; a small, quirky town whom both loves and hates them; an elderly relative with all the answers, and, of course, an enchanted garden. I read Practical Magic but it's been years. I didn't like the book so much, thought the movie was better when I saw it a couple months later. In any case, I didn't recognize the plot of this one or anything. Like I said, it's been a LONG time and it didn't leave a big impression on me. Question - would this be interesting even for people who don't like plants and gardening? I can't stand being outside. I hate plants, I hate gardening, the whole idea of touching and tending outside plants makes me shudder. Seriously. It has to do with growing up in Texas. It wasn't as bad when I lived in Wisconsin, but it took me 5 years to get to where I could just pull vines off a fence. With gloves. So anyway, I'm certainly no gardener - would this be fun for me to read then? Or is the connection to plants necessary? No, you probably don't need the connection. Only the main character's magical gift revolves around plants, and it's just as much about eating them as tending them. The rest of her family's talents are completely different. If you find the medieval history of the properties of food, herbs, etc., interesting, then you'd probably like this book, but it's not a requirement by any means. It is a fun read nonetheless. Would you rate this one or The Sugar Queen as better? I'm thinking I should probably give her a try. Oh, that's a tough one because I love sweets and gardening. They're both quick reads and typical romances with silly subplots, but I probably liked Garden Spells a little better. The magic in that one made more sense, not so out of the blue like in The Sugar Queen. I'd probably go with that one first, especially since you don't recall much of Practical Magic. I actually wasn't too crazy about Practical Magic (the book; I haven't seen the movie), but I've heard nothing but good things about Garden Spells. It sounds like something I'll enjoy and I plan to pick it up eventually. I haven't read Practical Magic but have heard that this one is better. I liked the movie though. It's too bad the book isn't as good. It's usually the opposite. If I remember right from 1999, the book was horribly written. I wasn't even a heavy reader back then, and didn't know anything about books, and I still thought it was awful. I have had this book in my hands at the library several times, but always put it back because the timing is just not right... I never thought of it as comparable to Practical Magic before. Not my favourite Alice Hoffman novel, but still readable. I will have to move this list further up the list! I loved Garden Spells! 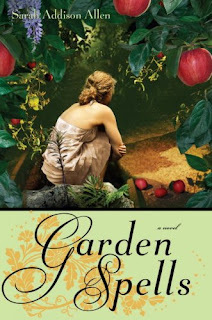 My favorite of her books is The Sugar Queen but Garden Spells is a very close second. Great review!